Emily took the bag with the lace curtains over to Laura and asked her to take them out. Laura took them out and Emily tried to put them on Laura. Kate decided this was a very good game and joined in too. Kate tried to put the lace curtains on Emily and both of them burst into a fit of giggles. They had great fun playing peep-a-boo together. As the girls had so much fun we plan to take the parachute out and play Peep-a-Boo with the rest of the children in the outdoor area. Emily’s Dad thought that was a great idea. 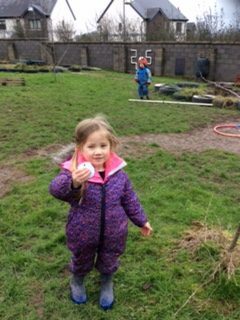 A conversation around treasure emerged recently in Crawford Childcare and the children were curious to know what a treasure hunt was. Sinead drew some coins on paper and the children painted and then laminated them. They then got a scissors and cut their money out. Sinead hid the coins all over the hike area, in trees, under rocks and in the grass. The children ran around searching for coins and gathered as many as they could find before they counted out their treasure. Emma’s Mum said she loved treasure hunts. Last week some of the children were collecting branches from the Christmas tree and they glued them in their special books. This week as there were still some branches left Steffi set up a table with branches, paper and paint and let the children create their own art work. As the children saw the table being set up they were curious to see what Steffi was doing. They quickly sat around the table and took a branch and dipped it in paint but two children decided to use their fingers instead. After a while, seeing their friends using the branches they started to use them too! Liam’s painting was still wet when he showed it to his Mum so she suggested he put it in his special book when it dried.